This 4.9 ha area within the town boundary, easily reached for public recreation, is one of over 220 reserves maintained by the Banks Peninsula District Council. The Council contracts out most work on its reserves, walkways and tracks. It also provides for eradication of noxious weeds and pests from reserves and assists community groups and Reserve Management Committees, providing funding where appropriate. The state of the Garden of Tane needs to be considered in these terms. 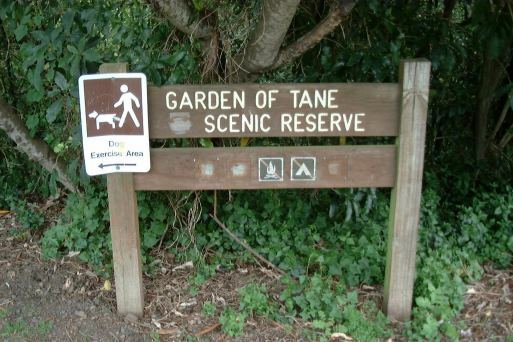 Formerly The Akaroa Domain, the area was classified for scenic purposes and named "Garden of Tane" in 1986 pursuant to the Reserves Act 1977. Department of Lands and Survey files on the area are held in archive but it appears that the Department of Conservation has not kept a file on the reserve since its inception in April 1987. It is not known if there are Banks Peninsula District Council files on its management. Preliminary historical research indicates it was established as The Akaroa Domain in the period of provincial government with a Domain Board appointed to oversee it. Development was well underway in 1876 when the provinces were abolished and the Akaroa Borough Council established. Then the Akaroa Domain Board resigned their trust in favour of the Borough Council. Information in the Akaroa Mail from its first issue in 1876 to 1905 reveals recurrent issues of public garden/reserve management that remain topical today. It shows that care of the reserve waxed and waned as individuals dedicated to it came and went. These records are also important in estimating the age of significant exotic trees in the reserve and provide a time scale for tracking regeneration of native vegetation on areas that were laid out in lawns and gardens. On 4 August 1876 The Mail reported that "The Akaroa Domain, which was a wilderness a few months ago has undergone a transition to render the grounds a most attractive resort in fine weather." Under supervision of Mr Roberts walks had been formed, seats erected, and the layout was such that "The scenery observed from several standpoints within the grounds is grand". The Domain Board meeting in August 1876 records that trees and shrubs "were judiciously planted out under the able supervision of the Rev Mr Aylmer, whose good taste and experience in these matters has proved most acceptable". In the same month there are references to the erection of a turnstile, lattice bridge, rustic summerhouse, tool house, dams, and planting of shrubs and flowers. In July 1878 there were plans for a water-well to fill a tank supplying a fountain and drinking facilities, a 3-m wide path from the main entrance to be shingled its entire length, and a croquet lawn. By this time over 60 varieties of conifer had been planted along with oaks, elms, beeches, sycamores, ash and others. These developments prompted prose in The Mail worthy of a tourist brochure - "At comparatively small expense they have converted what was once a wilderness, into a place suitable for recreation and health seeking" and, "Akaroa is gradually becoming known as a watering place and sanatorium; its Italian-like climate, romantic scenery and fine harbour are attracting visitors not only from Christchurch and other parts of Canterbury, but also from the other provinces". The developed Domain was seen as "a powerful inducement to visitors and invalids to prolong their stay...". After not being of much interest to The Mail for 18 years, The Domain reappeared as a hot topic in a strongly worded editorial on 28 July 1896 - "What other spirit of evil influence could ever have suggested to the Akaroa Domain Board the recent destruction of the native trees in the Domain, which they were practically sworn to cherish, honour and cultivate..." and, "is its state of native loveliness, in its manukas and its shining matipos and the rest of its greenery that goes to make the flora of New Zealand one of the most beautiful in the world". Greenies were at large then! This outcry arose from a new attempt "to give the place a park-like look" initiated by the Mayor who had a personal interest in the Domain. His Worship, Mr McGregor, lived next to the Domain, and when elected Chairman of the Domain Board it was recorded "there was hardly a day of the year on which he was not through some part of the Domain". Thus there was a further spate of exotic tree planting in 1898 including spruces, araucaria, cedars, cupressi, picea, pines and various deciduous trees supplied by Nairn & Sons, Christchurch, and supervised by the caretaker Mr Jolly. Vandalism was a problem in Mr McGregor's garden. In May 1899 there was public notice of a £1 reward for information that would lead to the conviction of the boy or boys who had cut and destroyed trees in the Domain. The reward was not claimed. Late in 1898 Cr Grange was concerned that English trees were displacing the bush and advocated planting native trees. The Mayor assured Grange that every care was being taken to preserve native bush. Nevertheless, in 1899 a hedge of 1000 macrocarpa was planted around The Domain and in 1900 manuka trees were cut for firewood. Mr Brittin replaced Jolly in 1903 and lived in the summerhouse. The Board consequently arranged installment of a chimney and windows to make it liveable in winter. Also the historic blockhouse was re-erected in the Domain. By 1904 the macrocarpa hedge was too much for the caretaker to manage so the greater part was removed, but part remains as large trees today. Gorse clearing and tree thinning were also too much for the caretaker and extra labour was employed to do this. The thinning of trees for firewood was a hot issue, and Mr Henning, Chairman of the Domain Management Committee, accused the Board Chairman of unilaterally deciding which trees should be removed. Little sign remains of the early constructions in the reserve. Nature is reclaiming it as bush. An article by Nigel Harrison in The Akaroa Mail 19 September 2003 relates to its recent history through a family involvement. Forty years ago his father was employed by the Council to look after The Domain and he engaged in a battle with Arthur Ericson as to how it should be managed. 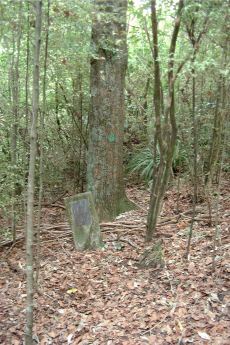 Ericson won, and his voluntary efforts dominated the management of what became the Garden of Tane until he died in 1991. Since then it seems to have become neglected. The issue for the field trip visit is whether the Garden of Tane is in its present state bringing biodiversity back into an urban environment in an appropriate way.